In the United States alone, deaths due to furniture and bed fires still rank as the top-most category of fire losses. The flammability of upholstered furniture is a major concern of engineers and others across a wide swath of organizations. This book was written to provide its audience with the science and engineering need to better understand the combustibility of the products they manufacture, purchase, and try to extinguish. Beginning with a brief overview of materials, safety design and standards, the text covers topics such as flame ignition, spread, toxic gases, heat release rate (HRR), test methods, fire hazard analysis, and selected regulations in the US, UK, and EU. 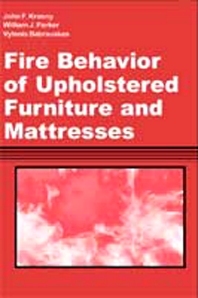 This book was written to address the science and engineering information needs of public and private sector fire technology personnel including fire service students and officers, fire investigators, fire protection engineers, government officials, textile, chemical, and furniture industry personnel, or institutional furniture purchasers. Fire Science & Technology, Inc.